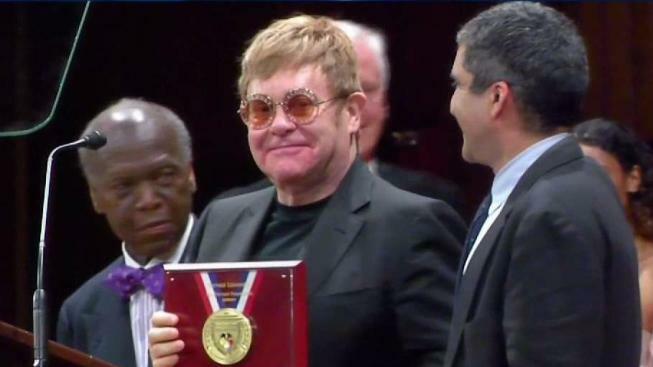 Elton John was in Cambridge, Massachusetts, to be honored at Harvard University. Elton John is being honored at Harvard University for his philanthropic efforts to fight HIV and AIDS. The 70-year-old singer will be awarded the Harvard Foundation's Peter J. Gomes Humanitarian Award in a ceremony Monday afternoon. Previous winners include former South African Archbishop Desmond Tutu and former Secretaries General of the United Nations Ban Ki-moon, Kofi Annan, Boutros Boutros-Ghali and Javier Perez de Cuellar.